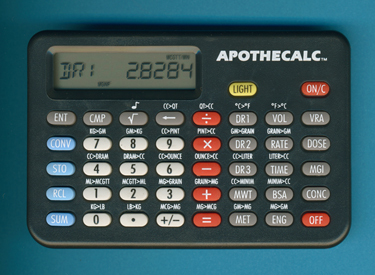 Size: 2.9" x 4.4" x 0.5"
This Apothecalc - the successor of the original Apothecalc introduced in 1988 by New Specialties, Inc. based in Vidalia, Georgia and based on the TI-35-II scientific calculator - is one of the few "non-translucent" calculators from Stokes Publishing. © Joerg Woerner, January 16, 2011. No reprints without written permission.